86 per cent of UAE residents don’t have home contents insurance. There is no shortage of compelling reasons why you need home insurance. Damage, whether it is caused by a natural disaster, accident or malicious intent could set you back considerably. And what could be worse than coping with the regret of not securing your home when you had a chance. It’s time to stop looking at home insurance as an extra expense, and instead treat it as a must-have to help protect your home and its contents. According to a 2015 survey by Souqalmal.com, 86 per cent of UAE residents don’t have home contents insurance. About 45 per cent of the survey respondents said that they didn’t consider it a priority. The indifference towards home insurance is more pronounced among tenants. But if you’re renting in Dubai and don’t think you need home insurance, think again. Even though your building may be insured by the landlord, what about the valuable contents of your home? Did you know you could specifically insure these contents, and protect them against damage due to all sorts of risks? Building cover – This covers the physical premises or building structure and is a must-have if you own a home, whether you live in it or rent it out. Home contents cover – This cover extends to the contents of your home like furniture, household goods and appliances. It is suitable for both home owners, as well as tenants. Personal belongings cover – This covers your personal belongings and valuables like personal electronic devices (your smartphone or laptop), jewelry, and other gadgets that can be carried outside the house. Home insurance isn’t expensive at all, but mishaps definitely could be! So, although you might be extra careful around the house, like never forgetting to turn the iron off, how can you be sure your neighbour is just as cautious too? Various risks surround us and our homes – fires, flooding, theft and more, and imagine the financial and emotional stress of coping with such an incident. Getting a home insurance policy and spending as little as Dh1 per day on your insurance premium, could save you a fortune. 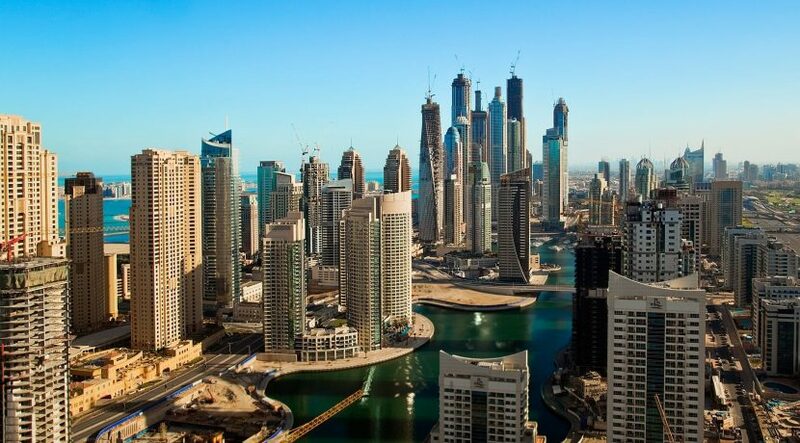 If you own your home in Dubai, a villa or apartment, you’ll probably only pay 0.06 per cent-0.08 per cent of the combined value of your home, contents and personal belongings! 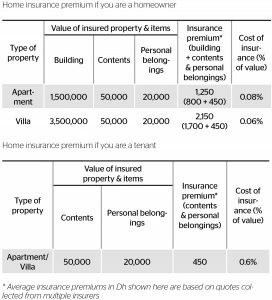 Assuming you own an apartment worth Dh1.5 million, and insured home contents and personal belongings amounting to Dh70,000, the estimated annual insurance premium of Dh1,250 is only a tiny fraction of their value. Doesn’t seem expensive at all! 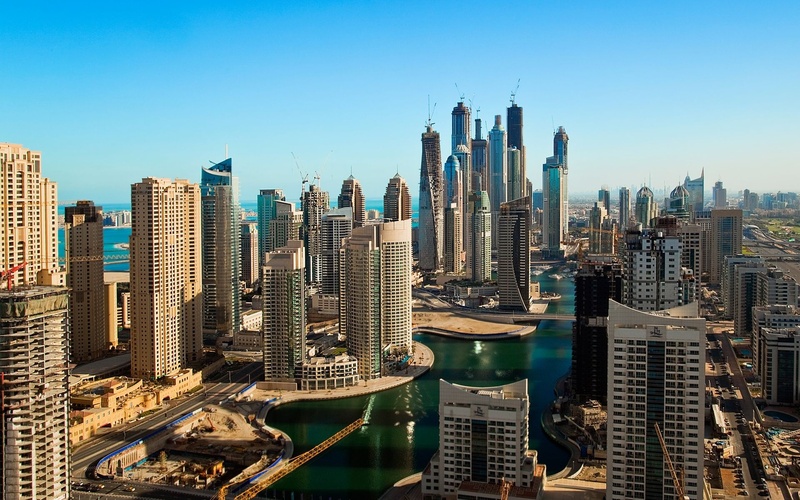 If you’re renting in Dubai, the cost of insuring your home is even lower, since all you have to worry about insuring are your home contents and personal belongings. An estimated annual insurance premium of Dh450 would cover contents and personal belongings worth Dh70,000 – that’s about 0.6 per cent of their insured value. The examples depicted above, make it clear that home insurance is indeed affordable, and it’s only a small price to pay, to ensure your home is protected against unforeseen disasters. You never know when you’ll need it, but if and when you do, home insurance could save you hundreds of thousands of dirhams.